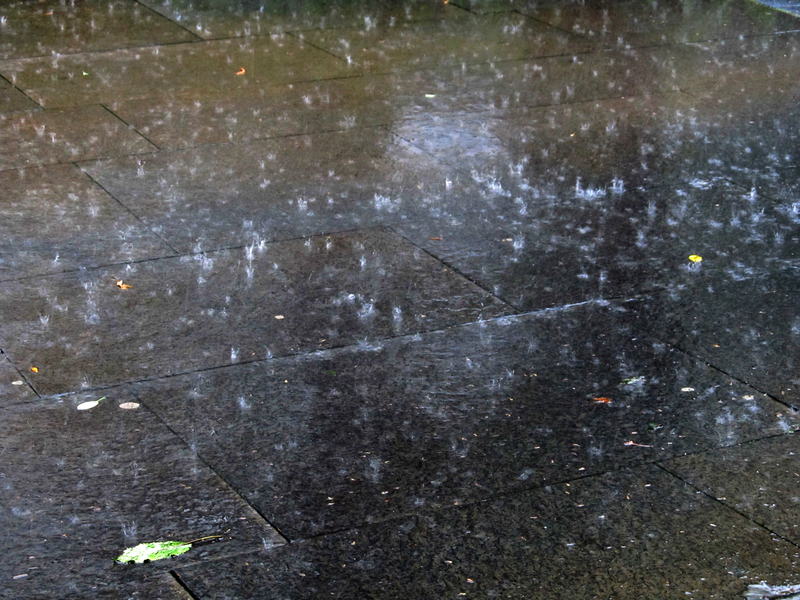 If, like me, you were near Bethnal Green tube around 6pm last night waiting for the Indian Summer to begin…then you may, like me, have been drenched by the Indian monsoon instead. Tom had been dropping not-so-subtle hints to cook Toad in the Hole (like leaving cooking magazines around the flat open at the Toad in the Hole recipe) so, I thought that it seemed like a good opportunity. 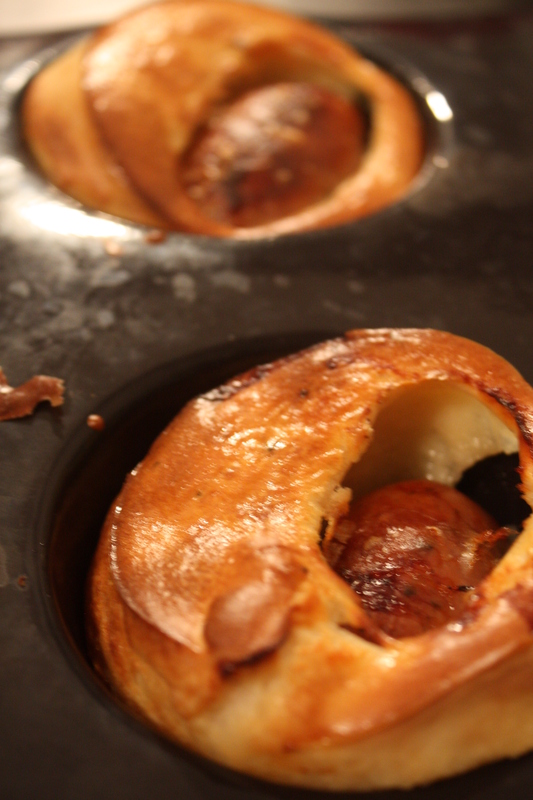 Now, before I launch into the recipe, I want to do a quick plug for mini toad in the holes. The problem I have with a tray-ful of toad in the hole is that it’s so much trickier to judge the ratio of sausage to batter. If the tray goes into the oven at a slant, then one side can end up batter-heavy, or if the sausages roll around then it’s hard to serve a neat portion of toad and hole to each person. 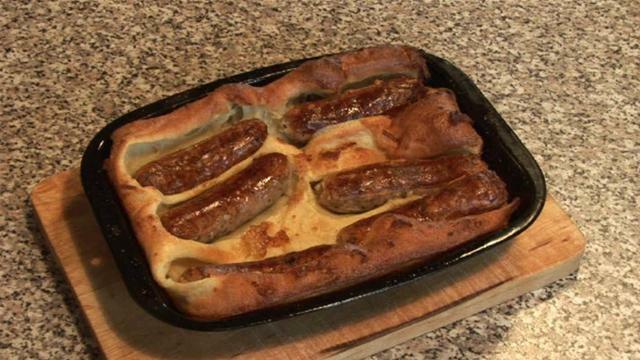 The other problem of making a tray of Toad in the Hole is that the batter in the middle takes longer to crisp up than the batter round the outside making it hard to cook the whole dish through to perfection. Mini Toads are easier to cook, neater to portion-control, and prettier to serve. Give them a go, and you won’t go back. If you’re using big sausages, start by turning them into little sausages. Make a couple of firm twists in the middle, and then snip through the knot of skin. Pop these in an oven at 200C for 20 minutes, turning them half way through cooking so they begin to brown all over. Put the flour in a jug and break the egg in a well in the middle. Pour on a little bit of the milk (50ml to start) and then beat it with a small whisk. If you get out all the lumps at this early stage, then you can pretty much guarantee hassle-free batter. Slowly add the rest of the milk. The batter should by this point have a similar consistency to double cream. If you fancy, add a little mustard powder, fresh mustard or pepper, then put the batter in the fridge until the sausages are done. 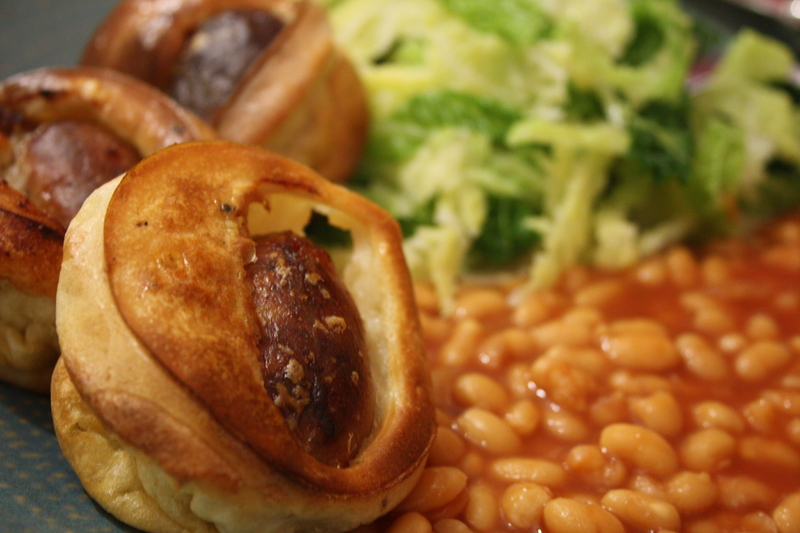 Pop the sausages into individual holes in a non-stick muffin tin. (If it’s not quite as non-stick as you’d like, then heat some oil in the bottom first – or if you don’t have a muffin tin then use ramekins). 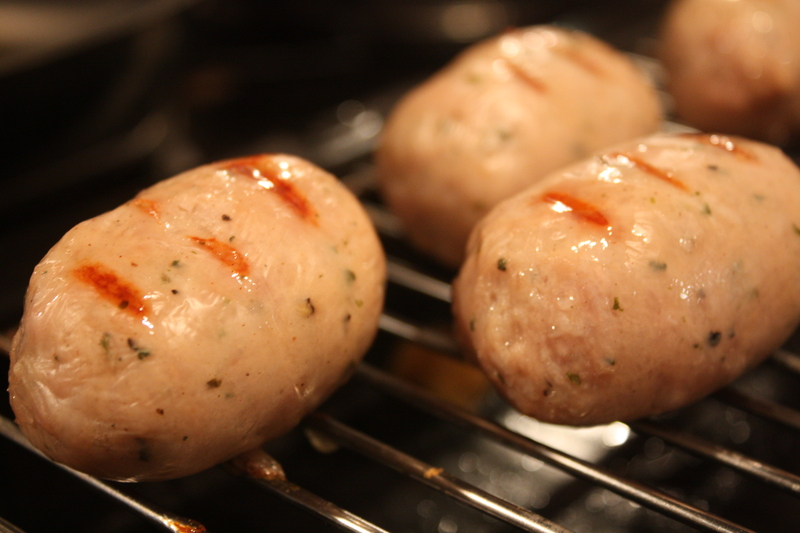 Now pour the batter on top of the sausages, and put them in the oven for 25 minutes (still at 200C—not the top shelf). If you’re feeling keen, then you could whisk up some onion gravy while your mini toads are cooking. 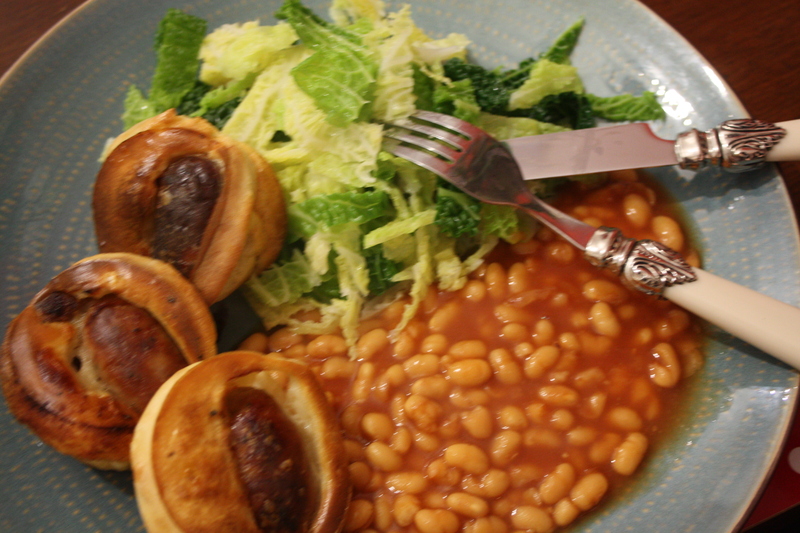 Or, if you’re feeling lazy, then a bit of cabbage and tinned beans create a retro, school-dinner feel. Delicious!